"I will love you forever Mom..."
It is with sadness that we announce the peaceful passing of Noreen Glass (nee O’Neill) at the Bow-Crest Long Term Care in Calgary Alberta on September 9th, 2018. She was born March 27th, 1930 in Montreal, Quebec Canada to Leo and Mary (Ferguson) O’Neil. She had a strong and resilient spirit but could not overcome a lengthy battle with Dementia, and complications of a recent lung infection. Noreen was christened and confirmed in the Roman Catholic church. She is one of the middle children of her seven siblings; 5 girls and 3 boys. The O’Neill family enjoyed warm relationships with each other and loved their parents dearly. 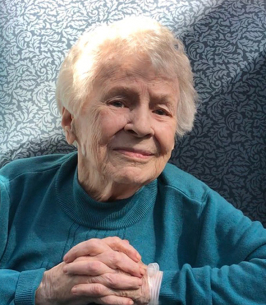 Of a modest home and education Noreen learned to speak French fluently by interacting and playing with the French speaking children in her neighborhood, demonstrating her willingness and ability to communicate and connect with all people from the very start. Noreen’s father Leo O’Neill died in 1944 when Noreen was 14 years old, forcing the entire family to cope with life with a saddened heart. Noreen and her family made the best of their lives despite this hardship, and right up to her final days she displayed the grace, kindness, respect and strength that were the hallmarks of her life. Noreen was fully bilingual and started working full time in her teenage years almost entirely in banks at the branch level throughout her working career. Living and working in downtown Montreal offered her the hustle and bustle and excitement and culture of a large French speaking metropolis. She retired in her sixties from The Royal Bank of Canada where she worked for many years. She was indeed a “working Mom” to us. Noreen cared for her mother Mary O’Neill (nee Ferguson) during her senior years, and as a result our grandmother was often woven into our daily lives throughout our childhood. In 1952, Noreen married Henry (Harry) Glass who was a gregarious, kind, and funny guy skilled at playing piano and guitar, and was often the life of the party. Noreen and Harry were a great match, and she loved to sing and dance (especially growing up through the “Swing Era”). They were married for almost 58 years until his passing in 2010. She is survived by her four children David (Carole), Sharon (Stuart), Stephen (Anne) Diane (Craig); six grandchildren Lisa, Joelle, Meagan, Laura, Kevin, Melissa; step granddaughter Emily; three great grandchildren Luca, Brooke and Wilhelm; and her sisters Barbara, and Ann. Along with the regular trials and tribulations that life brings Noreen had to overcome a serious pedestrian car accident in her fifties, and a battle with cancer in her early seventies. She had a strong constitution, and through courage, and determination she healed well, and moved on with life. In their senior years both Noreen and Harry in declining health moved to Alberta where Sharon and her husband Stuart graciously opened their home to care for them with support from her siblings. After her husband Harry’s passing she moved to an assisted living facility in Calgary Alberta. Noreen’s children were her priority. While not wealthy, Mom and Dad found a way to take summer vacations, participate in family gatherings, involve us in community events, local entertainment and sports, all the while, managing the household and shaping our character. Noreen taught us to look for the best in people. We walked many miles with Noreen at our sides’ while we were growing up. Her support for us was always steadfast and she continually found the strength and character to persist through thick and thin. Noreen maintained strong and loving connections with her friends, family, children, grandchildren and great grandchildren. Many people have sought out her grace, comfort and strength throughout the years. She provided these gifts willingly and abundantly because of her personal commitment to being kind and loving to others. Noreen’s achievements are written in the multitude of souls that she has touched. She was truly loved and will be missed by all who knew and loved her. A memorial ceremony will be held at a later date. In lieu of flowers, donations in her memory may be made to The Alzheimer’s Society of Canada or another charity of your choice. We encourage you to share any memorable photos or stories about Noreen. All tributes placed on and purchased through this memorial website will remain on in perpetuity for future generations. On behalf of my parents, Eddie & Gloria White, myself and my husband Doug, we'd like to offer our condolences at the passing of Noreen. She was a beautiful lady, very kind and thoughtful and both Noreen & Harry were very good friends to my parents. They travelled, went to dances and had lots of dinners out together and all with lots of fun and always some music. We are all thankful they were both part of our lives. Aunt Noreen was one of those incredible people in my life where only the good words come to mind. She was kind, loving, caring, generous, sympathetic and brave. She was also incredibly funny with a wicked sense of humor. I cannot express how saddened we all are for the entire Glass family. I am sending our love to all, especially from my Mother.